English pugilist; born in the first quarter of the nineteenth century; died after 1865. Bandoff entered the prize-ring to meet Jerry Duggan, Sept. 20, 1853, having been matched against him for £10 a side. The battle, which continued for seventy-five rounds, was interrupted by the approach of darkness, and the match was drawn. Bandoff next fought George Sims, and was beaten by him on two occasions; namely, on Nov. 8, 1854, and on May 17, 1858. Four years later, however, Bandoff retrieved his reputation as a fighter when he met and defeated Hopkinson after a battle of twenty-eight rounds (April 9, 1862). This victory was followed by another on Sept. 8, 1863, when Bandoff defeated the colored Australian, Jackson, at Home Circuit, after a battle of forty rounds. On the same spot he fought eighty-six rounds with Callaghan; but owing to darkness the match terminated in a draw. 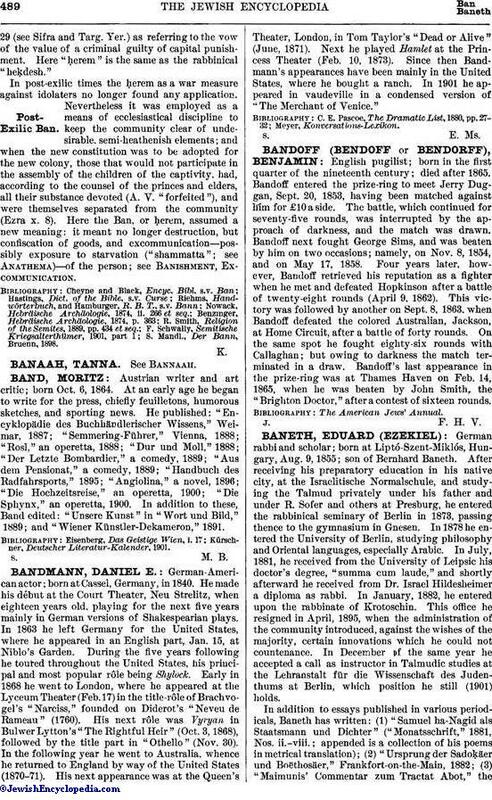 Bandoff's last appearance in the prize-ring was at Thames Haven on Feb. 14, 1865, when he was beaten by John Smith, the "Brighton Doctor," after a contest of sixteen rounds.